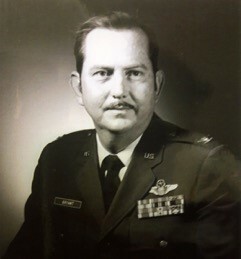 Col. Lucius G. Bryant, Jr., who went by “Lu” or “L.G.,” was born in Douglas, Georgia, on August 11, 1928, and died peacefully in Albuquerque on November 6, 2018, at the age of 90. He is survived by his wife of 60 years, Ula (Jo), and two children, son Robert of Austin, TX, and daughter Bonnie of Albuquerque. He is also survived by two siblings, Edith Elkins of Walnut Springs, LA, and Gary Bryant of Port Lucy, FL. He attended Miami High School in Florida, then joined the U.S. Army to fight in the Korean War. After his return, he attended Georgia Tech University on the G.I. Bill and graduated with a degree in Electrical Engineering. He worked briefly for General Electric, and then joined the Air Force and became a fighter pilot. L.G. and Jo were married in Austin, Texas in 1958 and they spent their early married life in England, at RAF Bentwaters base where he flew the F101 Voodoo jet fighter. He flew chase planes for some of the early Apollo missions for NASA and served in Vietnam as a Forward Air Controller, for which he was awarded the Silver Star and the Distinguished Flying Cross. He was then assigned to the Pentagon, during which time he earned a master’s degree from George Washington University. In 1974 he was appointed a senior officer at the Air Force Test and Evaluation center (now AFOTEC) at Kirtland Air Force Base in Albuquerque. After retiring from the Air Force in 1981, he became a senior executive at defense contractor BDM, Inc. In retirement, L.G., served his community as a frequent juror and jury foreman, and volunteered his time and computer skills to Futures for Children. He was a highly creative person, known for his keen sense of humor and fun personality. He had a lifelong passion for music—he played the coronet in high school, sang with the Georgia Tech Glee Club, built and played an electric organ, and assembled an extensive collection of vinyl records, favoring symphonies and operas. An enthusiastic audiophile, he was an early and avid adopter of “hi-fi” and stereo equipment as well as Macintosh computers. He was an officer in a local Apple users group where he helped many others troubleshooting technical problems. He participated in the local RC Model Airplane Club, and as a member of New Mexico Trout, he enjoyed fly fishing in local streams and throughout the West. A private service will be held later at Sunset Memorial Park where he will be interred in the Centennial Garden. Those wishing to honor L.G. may send donations to the Alzheimer’s Association 9500 Montgomery Blvd. NE, Albuq, NM 87111. "Goodnight, sweet prince; and flights of angels sing thee to thy rest”.